Garlic is a very powerful medicinal plant that has been existing for centuries. It is cultivated and eaten in almost all parts of the world. It is also known for its unique smell and aroma,of which some find offensive when eaten raw. This stinking smell is as a result of the sulfur compounds found in Garlic. The health benefits are outstanding. This is because it contains antibacterial, anti fungal and antiviral properties. This is just a tip of the ice berg. Garlic also helps with weight loss, healthy cardiovascular system and so many others. Garlic is also used in most cuisines because it enhances the taste of food and gives it a pleasant aroma. Fresh garlic has the most health benefits when consumed fresh. Alternatives are powdered ginger or those found in supplements. However, they will not be as effective as fresh ginger. A study was conducted to investigate the effects of allicin on weight in fructose-induced hyperlipidemic and hypertensive rats. At the end of the study, they found out that the the group of rats that was fed with fructose rich diet gained weight, while the group fed with allicin did not gain weight. Some of them even lost weight(1). This study shows that garlic may be beneficial in preventing weight gain for those who eat diets that are high in fructose. Some studies have established a link between eating garlic and its ability to prevent certain types of cancer. In one study, the anticancer effect of the administration of garlic and lemon aqueous extract against breast cancer implanted in mice was investigated. At the end of this study, 80% of the mice treated were cured with this combination. The combination of garlic and lemon activated the immune system, induced apoptosis(suicide of cancer cells) and inhibited angiogenesis (2). Another study showed that some common spices had chemo-preventive and therapeutic potentials on cancers, especially breast cancer cells. Garlic is also effective against oral pathogens (8). Furthermore, Garlic may help in the prevention and treatment of tuberculosis (9). Water extract of garlic is is effective against candida and drug resistant bacteria (10). Many natural healers in Africa use Garlic for the treatment of vaginal infections caused by yeast. Studies have showed that Garlic is able to kill yeast and may be effective in treating candida vaginitis (11). Consuming garlic has been shown to reduce the blood pressure of those who have high blood pressure(12) . In order to prevent the development of high blood pressure is advisable to include garlic in food. Another study also confirmed that garlic not only has antihypertensive potentials, but is also has antioxidants and cardioprotective effects (13). Hypertension predisposes us to cardiovascular diseases and garlic is able to help regulate hypertension. A study has showed that garlic supplementation has the potential for cardiovascular protection by reducing its risk factors (14). Garlic further reduces many risk factors associated with arteriosclerosis and significantly reduces our risk for heart attack and stroke (15). Consuming garlic is able to reduce bad cholesterol (LDL) in the body. This lowers the risk of developing heart diseases caused by bad cholesterol. A study has showed that Consumption of garlic is able to significantly reduce fasting blood glucose levels (16). Another article published on NCBI revealed that Garlic may be beneficial in regulating blood sugar in those suffering from type 2 Diabetes (17). The compound called allicin is high in sulfur. This is being used as an ingredient in some hair loss products. A study revealed garlic gel increased the efficacy betamethasone valerate cream in the treatment of alopecia (18). You may make garlic into a past and rub on your scalp or mix garlic paste in olive oil and massage into your scalp. Garlic has anti-obesity potentials as one study reveals. They investigated the effect of dietary garlic in rats that were made to be diabetic through diet. At the end of the study, dietary garlic was shown to reduce body weight through thermogenesis and reduce the mass of fat deposits in the skin the rats (19). More studies on humans need to be conducted to explore the potentials of garlic. Analgesics act against pain. Garlic has been shown to have anti-inflammatory and analgesic properties. It can therefore be used as a remedy for pain (20). Garlic is able to kill parasites that invade our body. It has antihelminthic properties and can worms (21). 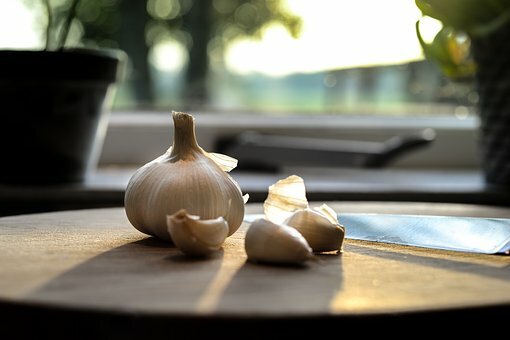 I'm in love now with garlic more than ever after reading this article! I was totally surprised on the benefits of garlic. Just imagine how garlic can fight many serious diseases such as cancer and other internal problems!